Learn how to permanently link two cards in such a way that no cut is visible. 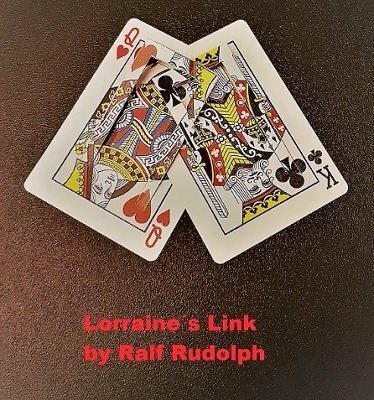 Ralf Rudolph, famous for his impossible objects, has spent many years researching and testing the method to link two cards in a seemingly impossible way, because no cut can be seen. Ralf shares in detail all the tools and secret supplies you will need to pull off this feat, and shows you in minute detail the process of how the cards are linked. Right in front of your eyes he creates his perfect Lorraine's Link . These linked cards make for wonderful presents, display objects, and conversation starters. Potentially you could first do a sleight-of-hand card linking, and then secretly exchange the linked cards with this permanent linked version to hand to the spectators. None of Ralf's linked cards have ever been found to contain a cut. You will learn how to hide the cut so that it will never be found, because it has been rendered invisible. While the preparation of the card is not very difficult, it requires some time, patience, practice, and of course the know-how. This secret has been kept for many years. Now you can learn how to do it yourself.